On behalf of We Are The Rangers Boys, I would like to auction off this signed shirt. The shirt is from the 2001/2 season, & I originally purchased it from a charity auction back in March/April 2005 on dot.org. The size is 50”/52”. It also has the number 2 on the back. All proceeds will go straight to Stan Bowles via his daughter. I will personally cover the postage to anywhere in The World to insure Stan receives every penny raised. 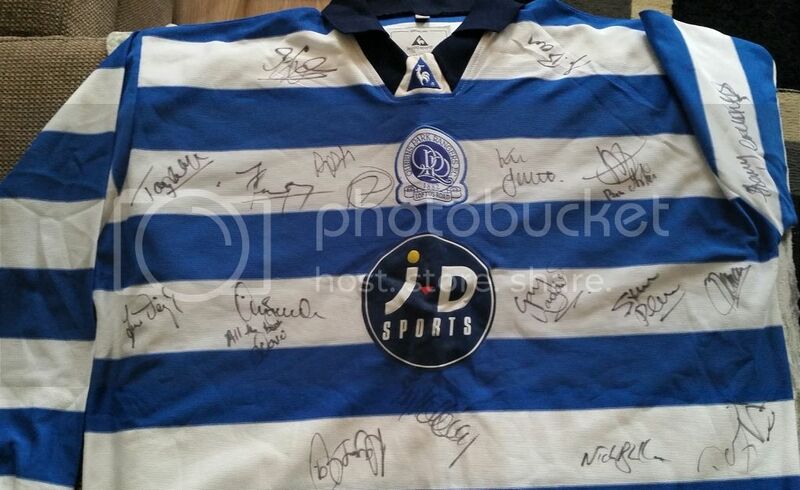 We may also be able to arrange to have the winning bidder collect it from an admin/mod at the last game of the season. In reference to the signatures, we are still trying to work them all out; if anyone recognizes any, please reply on here; if anyone would like me to send them the original photo, that will enable you to zoom in more, please PM me your Email address & I will send on over. Please dig deep, as this is a very worthy cause. If that's a number 7, I'm sure that was Matthew Rose that season. Some of them look like really clear names but then realised we never had players with those names. sorry if I missed it, but bidding is being done as posts on this thread? or via an official 3rd party like eBay? if so, link plz? You can either bid by replying on here or if you want ro remain anonymous you can PM a mod or admin who will enter the bid on your behalf.